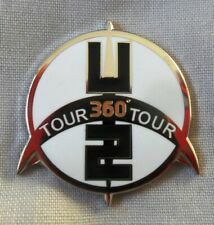 U2 Pin badge 80s new Old stock . Shipped with USPS First Class Package. Attachs to clothing using the new type stud and butterfly clasp. In very good condition for it's age. Light tarnishing to the reverse side. In great condition. Good luck all. BONO - U2 - LOGO-25MM - BUTTON BADGE- FREE POSTAGE! BONO - U2 logo. NOVELTY 1" BUTTON BADGE. Pair of vintage U2 War Badge pins 1980's. Condition is Good. Dispatched with Royal Mail 2nd Class Large Letter. This badge is over 20 years old and not a modern repro. In very good condition. Light tarnishing to the reverse side, consistent with age. 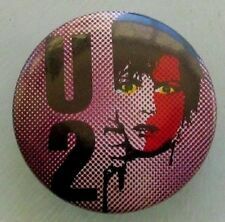 (U2-NICE BADGE-BONO-THE EDGE-LARRY MULLEN-ADAM CLAYTON.GOOD LITTLE LOOKING BADGE ;-). GOOD CONDITION WITH THE USUAL LITTLE BITS OF WEAR N TEAR WITH A WELL USED BADGE -SEE PIC. Old/Vtg Button Pin /B adge. This badge is well over 25 years old and not a modern repro.